UFC Philadelphia goes down on March 30. The card will be headlined by a lightweight bloodletting between Edson Barboza and Justin Gaethje. Other highlights of the bill include a strawweight fight between Michelle Waterson and Karolina Kowalkiewicz, and a lightweight scrap between Ross Pearson and Desmond Green. See the poster for this card, featuring the profiles of the two headliners, below. Your poster for @EdsonBarbozaJR vs @Justin_Gaethje has arrived. UFC 236 goes down two weeks later on April 13, in Atlanta, Georgia. The card will be topped by a pair of interim title fights — it’s the first UFC card ever to feature two interim championships. 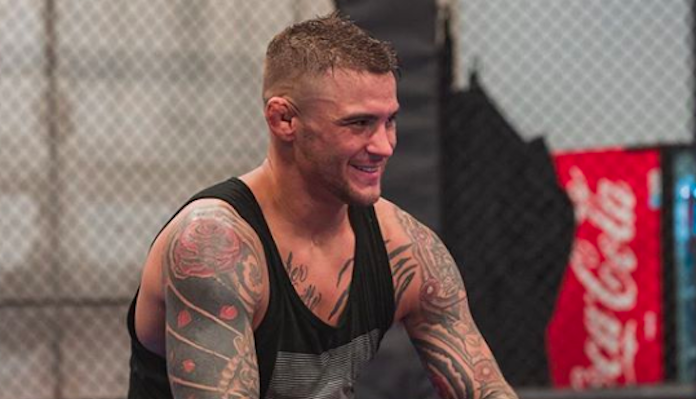 The headlining bout will occur in the lightweight division, where streaking contender Dustin Poirier will take on reigning UFC featherweight champion Max Holloway. The winner is expected to battle undisputed champion Khabib Nurmagomedov sometime later this year. The UFC 236 co-headliner will occur in the middleweight division, where Kelvin Gastelum will take on Israel Adesanya. Gastelum was supposed to battle undisputed champ Rob Whittaker earlier this year, but was unfortunately deprived of the chance when Whittaker withdrew from the fight at the last minute. Other highlights of the card announced so far include a light heavyweight rematch between Ovince Saint Preux and Nikita Krylov, a light heavyweight bout between Khalil Rountree and Eryk Anders, and a flyweight bout between Wilson Reis and Alexandre Pantoja. Here’s the official UFC 236 poster, featuring all four fighters bidding for interim gold. What do you think of the official posters for UFC 236 and UFC Philadelphia? Join the conversation in the comments section below.